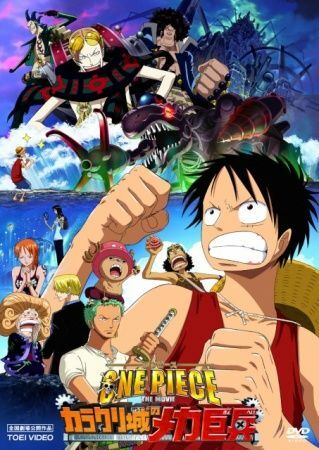 One day, when Luffy, Zoro, and Nami were starving on their little boat, they are attacked by a long-neck dragon. The dragon wrecks the boat when Luffy bites into it, then takes Nami back with it. Meanwhile, Luffy and Zoro wash up on the shores of an island where Ganzack is using the island's inhabitants as slave labour to complete his base and ship. There, the two boys meet a girl named Medaka. Together with the girl, they infiltrate Ganzack's base. Era uma época em que governou piratas dos mares. 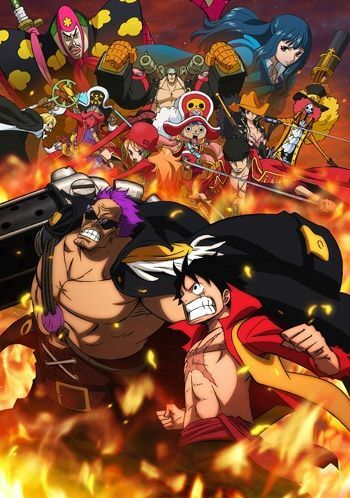 Várias bandas de piratas lutavam durante o grande tesouro escondido, One Piece, que foi deixada pelo capitão agora lendário pirata Gold Roger. Havia um garoto que admirava os piratas, seu nome foi Monkey D. Luffy. Um dia, ele come por engano o Devil `s frutas e transforma-se em um ser humano de borracha. Dez anos se passaram desde aquele incidente. Luffy define a velejar sozinho. Ele expõe a tornar-se um grande capitão pirata e hat `s quando a sua grande aventura começa. "Estou indo para ser o Rei dos Piratas! 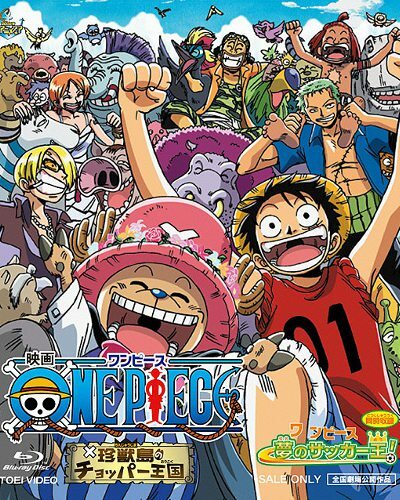 Eu estou indo para obter One Piece !". Note: The movie takes place after episode 18. Not only was their ship stolen, but Nami too! 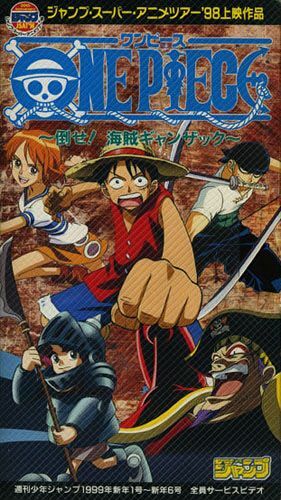 In order to get them back, Luffy and his pirate crew meet the mysterious Trump Brothers Borodo and Akisu, who lead them towards clockwork island, a city dictated by a band of ruthless card-pirates! 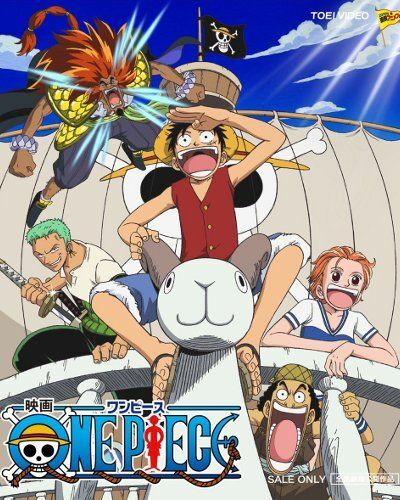 High adventure ensues as the Straw Hat pirate crew take back what is rightfully theirs. Note: The movie takes place after episode 53. 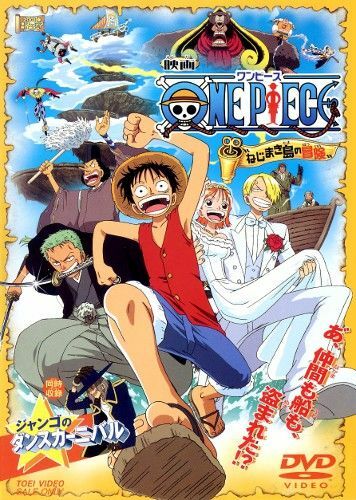 When Luffy and friends stumble across a rumoured island hidden by clouds, there is much excitement. However, instead of hunting for treasure, the crew end up hunting for Chopper instead! And speaking of hunting, why are there 3 strange guys lurking on this island going after animals with horns? An action filled adventure awaits, and the island's true treasure is discovered. Forget Pirate King, what would you say about becoming the Animal King? Note: The movie takes place after episode 95. After being chased by the Marine through a huge storm, the crew arrives at the harbour of Hannabal. After stuffing themselves - or rather Luffy - Nami's nose picks up on the smell of money. Drawn in by the prize money of 300.000.000 Beri, they decide to take part in the every few years happening everything-goes race to reach a certain destination - alive. On the night before the race they happen to make contact with Gasparde, an ex-Marine that is feared by other pirates and hated by the Marine; his gang; and Shuraiya Bascud, a headhunter that is more than he seems at first. After the night is over, the morning arrives and thus the beginning of their new Dead End Adventure. Note: The movie takes place after episode 130. 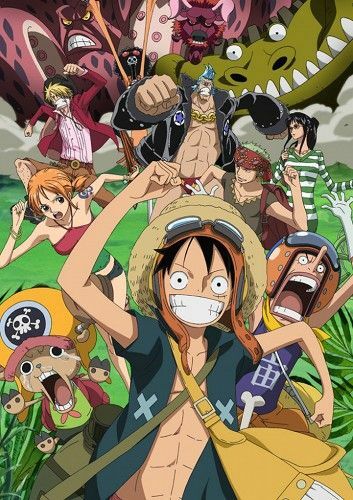 Luffy and crew go to an island searching for a legendary sword, said to be the most expensive in the world. Soon, attacking marines and beautiful maidens split the crew. 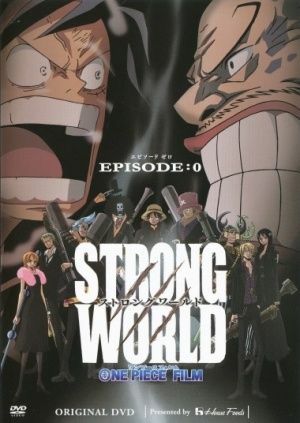 Zoro betrays the crew to help an old friend, Luffy and Usopp wander through a cave, and the rest help a village fight marines. When Zoro defeats Sanji he takes the sacred pearls that are the only defense against the evil sword that will plunge the world into darkness. 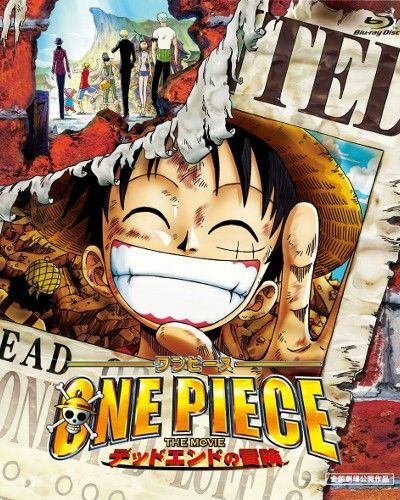 Luffy finds a glass bottle floating in the water with a map to Omatsuri Island and a notice saying he's been chosen among the 100,000,000 pirates of Grand Line to go there for adventure. Of course everyone smells something fishy except the only person that counts, Luffy. So they go. It would appear that there's nothing special about the island but suddenly a magical theme park, parade and chorus all appear before their eyes welcoming them. At the center of it all is the Baron Omatsuri. What secrets and dangers wait for them on the island? In tempest, Grand Line, Luffy and his gang got in a ship about to sink, and they found a big treasure box. They were delighted to open it, but what they found wasn't treasure but an old woman wearing a gold tooth. She was hiding in the box because the ship was sinking. She said if they would take her to her island she would give them the legendary treasure, Golden Crown. Thinking that they would get new treasure, they left for the island. When they arrived at the island, they heard someone singing a folk song, "The king of the sea, the golden crown...". And they learnt that the name of the island was Mecka Island, and that the building standing there was Mecka Castle. Suddenly Ratchet, the son of the old woman, appeared. He thought Luffy was the pirate who had kidnapped her, and he took her home without listening to her. But, they couldn't abandon the treasure. They thought there was a clue about the treasure in the lyrics of the folk song, and they began to look for the treasure. However, traps beyond their imaginations were waiting for them. 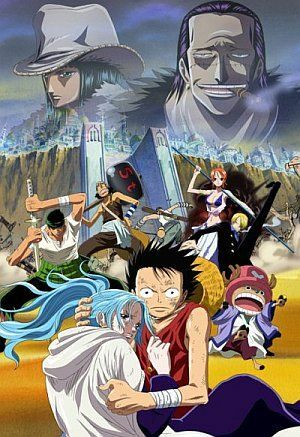 A complete re-telling of the Alabaster Arc from One Piece TV series. 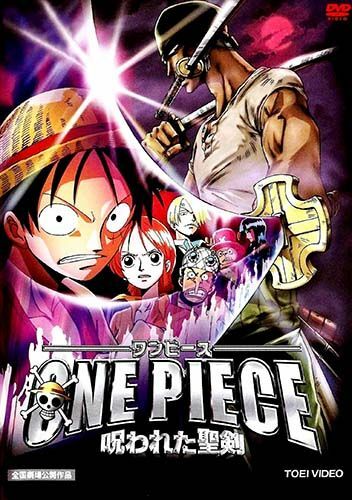 Luffy and his pirate crew come to rescue a land in the midst of a civil war, due to a powerful devil fruit user. 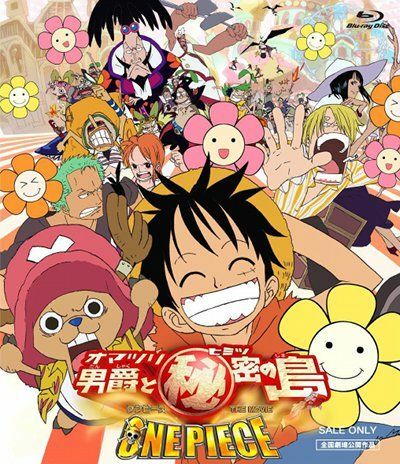 Luffy was attacked by a young girl, Silk, who mistook him for a member of the other pirate gang. As the two eat a meal, they tell their stories. Meanwhile, Gary and his band are burning with anger at Luffy, demanding payment from the town's defenseless citizens...!! 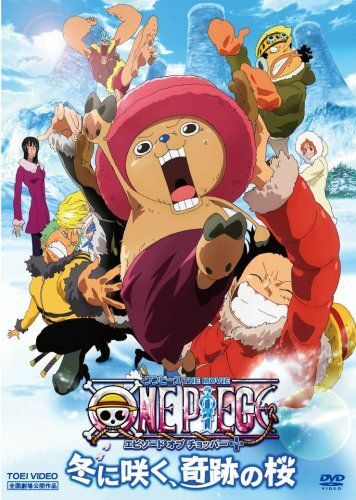 Note: This is an animated version of the "Episode 0" manga, and released on 3,000 limited-edition DVDs that were given to winners of a mail-in competition which took place between the period of 16.11.2009 to 15.01.2010. Disclaimer: The dvd begins with scenes from the finale of movie 10. To avoid them, skip to the second chapter in the video. 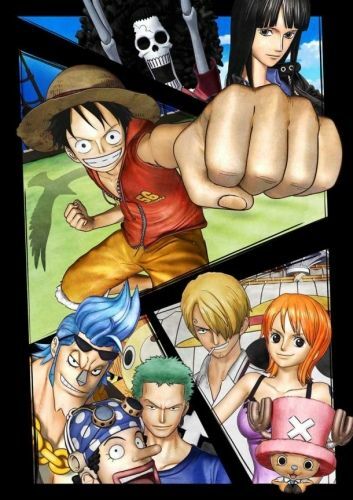 Toei Animation is producing the Jump Heroes Film double billing 3D films of Toriko and One Piece with original stories. 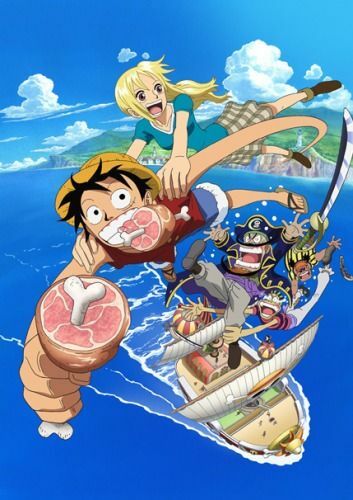 Plot Summary: Luffy and his crew must find his missing hat.